Red Rack'em is back with a heavy EP of genre crossing magic which ushers forth a more edgy, psychedelic sound. 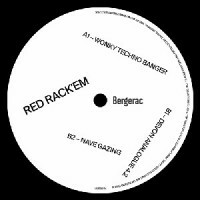 Like its disco leaning predecessor, 'Wonky Techno Banger' is just simply a track that you have to have in your life. Combining a demented fairground melody, flappy off beat bassline and manic peak time flavour, it’s an absolute thumper which has the potential to radically transform your night/life. Devon Analogue 4.2 comes from the same session and sees the Bergerac boss man go into euphoric electro funk mode with distorted claps, an ‘ecstasy’ synth and live slap bass. The final track 'Nave Gazing' was written using just the Waldorf Nave for a thoughtful ambient number to close off the EP. And this B2 is the one we are more keen here at Picc. Sil says: Like the very successful predecessor, Red Rack'em procures you with his understanding of a techno banger for you to enjoy. However, the one we are raving about is the B2 'Nave Gazing', a smooth operator, chilled bassline 'banger'! Enjoy.